In Wisconsin, winter’s always around the corner. So, it’s always a good time to start thinking about inspecting and maintaining your chimney. Here in Milwaukee, January highs top out at a balmy 29 degrees Fahrenheit, perfect for gathering the family around the fireplace. But before doing that, you need to hire a chimney cleaning service to come out and knock the cobwebs out of the flue. Here are five excellent reasons to pick up the phone and have an expert inspect the chimney. According to the National Fire Inspection Association, chimneys should be inspected at least once per year. Chimney fires happen when creosote, a thick, flammable byproduct of wood burning, builds up in your chimney. These fires can be explosive, damaging your chimney, house, and possibly the people inside. One way to stop creosote? 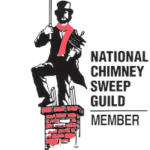 Hire a chimney cleaning service to come inspect and clean your chimney annually! Another good reason to hire a service is to lengthen the life of your chimney. Regular inspections help identify cracks and faults in masonry. Left unchecked, these faults can quickly become worse as you continue to use your fireplace with the damage in place. Taken care of, chimneys can last a century or longer. But they need regular care to make this possible. The life you save may not just be your own. Chimney cleaning and inspection can help identify critters that may have made a home of your chimney in the spring and summer months. It’s also important to safely clear debris from the chimney – whether made by animals or weather – before you put your first logs of the season on the fire. Don’t be penny wise and pound foolish. One of the biggest reasons to hire a chimney cleaning service is to save money in the long run. A few-hundred-dollar fix today could become a job costing in the thousands by next season if left unchecked. Think of chimney cleaning and inspection like getting a regular oil change on your car. You might not notice an immediate benefit, but it can help you put that many more years and miles on it safely. This is a small thing, but getting your chimney inspected and cleaned can also help homeowners identify other problems related to the chimney and roof. Maybe the liner needs to be replaced. Maybe there are structural deficiencies that would have gone otherwise unnoticed. How often do you get up onto your roof? Sometimes, in the process of routine inspection, inspectors can alert homeowners to other issues (loose shingling, damaged flashing, etc.) that they can have another expert in that field come investigate. With more than two decades of experience, we know the ins and outs of Milwaukee’s chimneys like the backs of our hands. And it’s not just inspections and cleanings, either. We also do flue installation and repair, rain caps, firebox repairs, and more. Check out our full list of services here and contact us today.